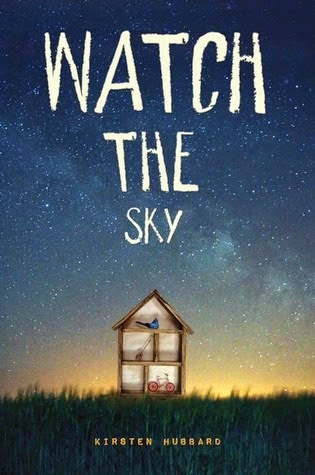 I was a huge fan of Kirsten Hubbard's Wanderlove and Like Mandarin, so was very excited to read her first middle grade novel, Watch the Sky. The cover drew me in, and I was thrilled when NetGalley accepted my request to read it early. I'm always looking for the next read aloud for my fifth graders. Unfortunately, this won't be it. Jory's life is anything but typical. His family spends their lives preparing for an attack, searching for signs, and trying to avoid the notice of Officials. His stepfather, Caleb, believes that something is coming, so they must prepare. Jory is enrolled in public school so that he can "hide in plain sight," but this taste of normalcy makes him question if Caleb is right. Jory doesn't know who to believe, but he does know that time is running out. I felt anxious for Jory throughout the entire novel. Caleb was such a dangerous character, full of mercurial moods and strange beliefs. It made me sad to see him instill fear in the family, and feed off of Jory's mother's agoraphobia and weakness. Luckily, he had his adopted sister, Kit, a strange girl with selective mutism. Hubbard keeps hinting that Kit might be an alien, or at least that she has a fascinating back story, but we never get it. I wish we had learned more about the most interesting character in the book. More than anything, the reason I won't be sharing the book is the ending. I'm an adult and had a hard time figuring out what happened. No spoilers, but I couldn't tell if a character died or not. If I was sent to the internet to search for answers, I'm sure my students would be even more confused. I was disappointed by Watch the Sky, but haven't lost my faith in Hubbard.